Do you have a general sense of overwhelm? Does it show up as never having enough time? Or do you feel like you’re losing your mental clarity? Do you just have too much stuff? Maybe your organizing goals aren’t as lofty as becoming a minimalist, but there are three principles you can borrow from this movement without joining it, to help lessen overwhelm. The hallmark of a minimalist lifestyle is a de-cluttered home. So, start with this! Practicing clutter-clearing is extremely powerful. Minimalist Joshua Becker, who recently hosted a webinar for NAPO, said he started the whole journey by picking an area in his home and de-cluttering it. He started with his car, which is an extension of your home, especially when it’s cluttered, right? He was astonished at the amount of stuff contained in the car, and at the improvement it made in his daily life after it was de-cluttered. Almost everyone I know who de-clutters has a similar experience to this: once you start de-cluttering one specific area in your home, you delightfully discover it has a snowball effect in unraveling energy to de-clutter another area! This points to one wonderful benefit of minimalism – it energizes you. A great resource to help you is Clear Your Clutter with Feng Shui by Karen Kingston. When I was 16, I found myself wandering in a used bookstore one day and this book caught my eye. I bought it, devoured its contents, started clutter-clearing the same day and have never looked back. My life today would be very different if I hadn’t practiced clutter-clearing over the past decade, and I am so thankful. Along with clutter-clearing, a minimalist principle you can start to integrate into your life immediately is simplicity. One organizing technique we use with clients is K.I.S.S., that is, Keep It Simple Sweetie. For the past year, one of my mantras is, “Keep following my intuition to simplify, simplify, simplify!” I have gone through many life transitions this past year, including moving onto a sailboat, and this mantra was my anchor. Pun intended. What in your life isn’t working for you right now? Are you over-committed? 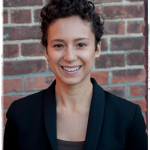 Simplify by giving yourself permission to step down as a board member, or to say no to an invitation this weekend. Too much to read or mail to go through? Simplify by giving yourself permission to drop un-important, unopened mail and catalogs right into the recycling bin. Swoop! Do you just have a general sense of overwhelm? Simplify by sitting down and doing nothing for five minutes (yes, five whole minutes!). In any scenario, any circumstance, you can always ask yourself the empowering question, “What can I do right now to make this even simpler?” After you’ve played with simplifying, you may see how much room there is to simplify, both with stuff and organizing systems, as well as with intangibles like time and mental clutter. The final principle of minimalism I’d love to share with you is using what you have. Being a minimalist is good for your brain because it forces you to be resourceful and think outside the box with the items you own or the way you use them. For example, when I think about what to buy at the grocery store, I look at (or think of) what I already have to use up, including staples like oils and spices. I’ll then fill in the blanks with what to buy at the store. This solves three problems: saving money on groceries, wasting less food, and using up the pantry staples I have while they’re fresh. When you de-clutter and simplify, you end up using the items you own and finishing the projects you have. This is true at the micro level and the macro level, such as with the task of buying groceries, or with eating healthy on a consistent basis. Energized about integrating minimalist principles but want more support? 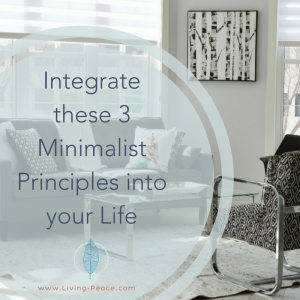 Be sure to join the organizing team at the Living-Peace Spring Organizing Workshop, where I will present and conduct an exercise to get you on your way to integrating minimalist principles into your life.